Over the weekend a picture was doing the rounds on social media showing how one unknown footie fan had got a tattoo in memory of the Luis Suarez biting controversy. 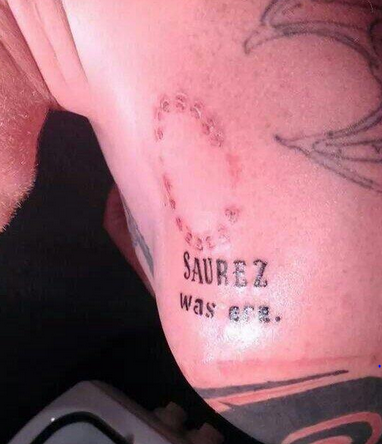 That guy, who we can only assume is not a Liverpool fan, had the words ‘Suarez was ere’ and four red teeth marks inked onto the back of his body. Now, only a couple of days later, another person has followed the trend. On this occasion the bite mark is far more prominent, however disappointingly this new tattoo lacks the originality factor. 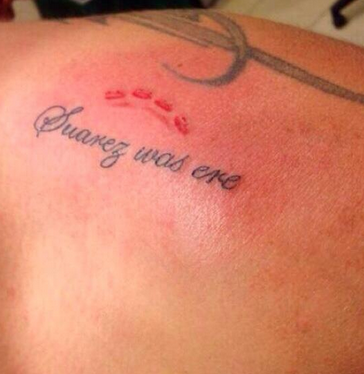 It’s also worth noting that whoever commissioned the tattoo didn’t know how to spell “Suarez” either.